My friend in Ecuador couldn't believe it when I said having a car again would be a complication for me. A friend and I were enjoying a few adult beverages together recently. He lives in Paute, a small village about a 45-minute commute from Cuenca that is growing increasingly popular with expats. During our conversation he asked me if I would ever consider moving there. “No way,” was my quick reply. “Mostly because I’d have to own a vehicle again,” I told him. The day before my wife Cynthia and I boarded a plane to Cuenca, Ecuador. I exchanged our car keys for a check at an auto dealership in Las Vegas. It was a joyous transaction and one of my best financial moves ever, because I got rid of something I no longer wanted. The check I was handed paid for our belongings to be shipped to Cuenca. This isn’t our first experience of living without a car. Back when we lived in Charleston, South Carolina, we walked everywhere. Many evenings we took leisurely strolls through its lovely colonial neighborhoods, walking hand in hand and enjoying the scent of blooming star jasmine and hyacinth mixed with soft ocean breezes. This respite, sandwiched between long years of suburban living where vehicle ownership is a must for survival, made a lasting impression. 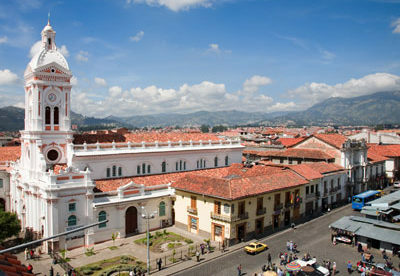 We relished the opportunity to abandon the need for a car when we decided to relocate to Cuenca. The health benefits of walking are well documented, and this daily exercise combined with a diet of local healthy fruits and vegetables is one of the reasons expats in Cuenca often lose significant amounts of weight. I enjoy walking around the city for another reason. Being out and about keeps me connected. I feel immersed in the culture as I smell the bakeries, hear the honking horns, and pass the tiny indigenous ladies with all manner of things strapped to their backs (while sometimes talking on cell phones!). Walking compels me to relax and slow down. If I had a car I could certainly get things done quicker… but why? I’ve got plenty of time, and I’m grateful for how this activity allows me to symbolically enjoy the journey instead of always being focused on the destination. Several of my friends own vehicles, and there is no right or wrong decision regarding this totally personal issue. Some of them want the freedom to travel around the country more, and others have admitted they just enjoy being behind the wheel. For me, having a car again would be a burden and complication. I have no desire to deal with driving, parking, maintenance, and insurance. I know how folks drive around here—I don’t want the stress of constantly guessing what the driver in front of, behind, and beside me is going to do! Editor’s Note: Learn more about Ecuador and other countries in IL’s daily postcard e-letter. Sign up for these free daily postcards here and we’ll send you a FREE REPORT – Ecuador: Live Like Royalty on Your Social Security.